Posted on Thu, Mar 15, 2012 : 7:42 p.m.
NASHVILLE, Tenn. -- National pundits offered various reasons why the Michigan basketball team will open the 2012 NCAA Tournament as a popular upset pick. But perhaps the most common theme in that speculation centered around the Wolverines' heavy reliance on the 3-point shot, and Ohio's ability to defend it. Fourth-seeded Michigan shot more 3-point shots than any other Big Ten team this season, and 13th-seeded Ohio had the 14th-best defense nationally against the long ball. "They get into you, they climb up, they'll let you catch the ball, but afterward they really try to heat you up," said Michigan senior co-captain Zack Novak, who will help lead the Wolverines into a second-round tilt against the Bobcats on Friday (7:20 p.m., TNT) in Nashville, Tenn. "It'll be just a battle. We run good action, they guard the 3-point well. "But if we execute, we should be able to get some good looks." Michigan attempted 743 shots from beyond the 3-point arc this season, the 10th-most nationally. Tim Hardaway Jr. runs through shooting drills at Bridgestone Arena in Nashville, Tenn., on Thursday. 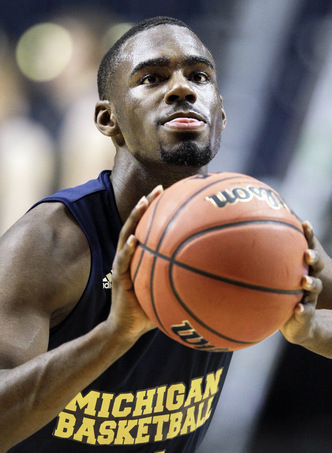 The Wolverines' heavy 3-point shooting will be challenged by Ohio's solid perimeter defense. The Wolverines only shot 35.2 percent as a team on the year, but possess capable shooters at each position, especially when Novak lines up at the power forward spot alongside 6-foot-9 sophomore Evan Smotrycz at center. So, when the Bobcats were asked what the No. 1 thing on their to-do list was against the Wolverines, the answer came easy and quickly. "Obviously it's 3-point shooting," Ohio junior guard Walter Offutt said. "It's something coach (John) Beilein has emphasized throughout his coaching career. "It's pretty much the 3-point ball." Roughly five seconds later, Bobcat point guard D.J. Cooper echoed his teammate's sentiment. "Same thing as he said," Cooper responded. "Not letting them penetrate and kick to the 3-point ball." A tenacious 3-point defending squad, Ohio led the Mid-American Conference and was 14th nationally in 3-point defense, holding opponents to a 29.5-percent success rate on the season. But that's not the only thing the Bobcats do well defensively. Ohio's 17.7 forced turnovers per game is the second-best rate in America. More importantly, Ohio averages 18.9 points per game off those turnovers, roughly 27 percent of the team's total points all season. Turnovers haven't typically been an issue for Michigan this season (it averages just 10.9 per game), but they were in the team's last outing against Ohio State, when freshman point guard Trey Burke committed eight of the team's 18 turnovers. "We have to execute," Burke said. "We watched a lot of film over the last couple weeks, we know they're good at forcing turnovers. "We'll take what the defense gives us, we'll take a look at whatever they give us, and go from there."